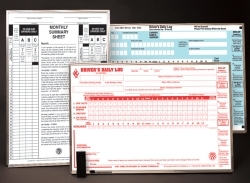 The KellerSCAN® Daily Log Melamine Board Chart With Aluminum Frames 880-R is an oversized KellerSCAN® Daily Logs. This makes a great tool for drivers training. Teach your drivers how to fill our their logs by showing them with this oversize reproduction of the actual log book. This oversize melamine board chart comes with an aluminum frame with wall hooks for mounting, and includes a marker, oversize log ruler and an eraser.